I Want To Make Games! Great! GameBeans is here to help you get your idea on the screen with as little fuss as possible. You're a click away from the GameBeans IDE, that's where you make your game. A click away from the Docs, the Tutorials and the Demos that'll help you learn how to make what you want! And it's all free, so have a look around and discover if GameBeans is for you! That's OK! We understand that, to a beginner, code can be scary. 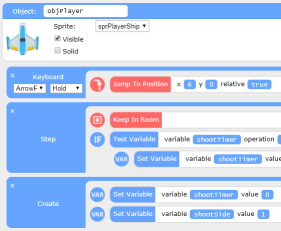 GameBeans helps introduce you to programming concepts in simple, easy ways! GameBeans allows you to create games visually, and using language and terms that anyone can understand. You can see for yourself in our examples below. GameBeans games are exported as HTML5 apps. Which means they run in web browsers. Which means they can run on anything that can run a browser; PC, Mac, Linux, phones, tablets, etc. It's also possible to create "native" apps from GameBeans games using tools like PhoneGap or NW.js. GameBeans is currently under early development. You can get involved in the development by joining our Discord server and telling us of your experiences using GameBeans, and what we can do to help make it the right tool for you! Object > Event > Action driven. GameBeans uses an intuitive event-driven system. Events are assigned to Objects that represent things in your game, like the player, enemies or pickups. Events are triggered by things that happen in your game, either all the time like the "Step" and "Draw" events or under certain conditions, like "Input" events or the "Collision" event that happens when two objects touch. Events contain Actions. Actions are how you decide what happens, like moving the player, shooting bullets, playing sounds, etc. GameBeans is designed to be simple and clutter-free and put all the tools you need just a click away. In the center is your workspace, this is where resources like your Objects, Sprite, Sounds and Rooms open for editing. On the right is the Project View, this gives you access to things like your game's global settings and resources. And on the left is the Context View, this view will change depending on what resource you have open in the workspace, so if you have an Object open, you'll have access to Events and Actions here. GameBeans uses it's own lightweight code editor.